Breakfast is by far my favorite meal of the day. I love eggs, fruit, and if I’m being honest, waffles and pancakes. Because I’m avoiding those last two for the remainder of my Whole 30, I need to brainstorm healthy and tasty options each morning. I do a lot of prep ahead of time and cook when the baby is down for his first nap or before papa leaves for work. Here’s what I prepared last week! I hope you might get some ideas for your own meals. 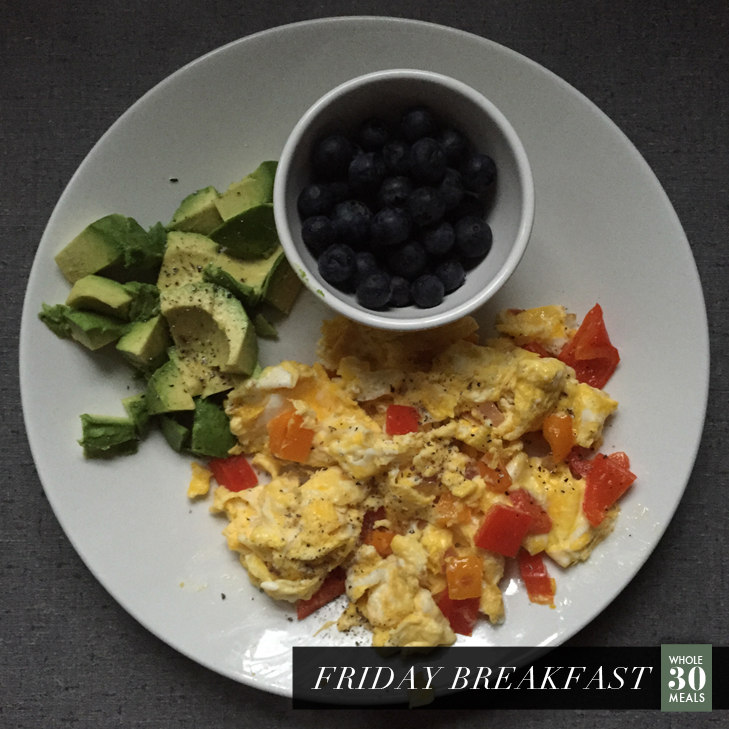 Scrambles are my go to egg preparation of choice. 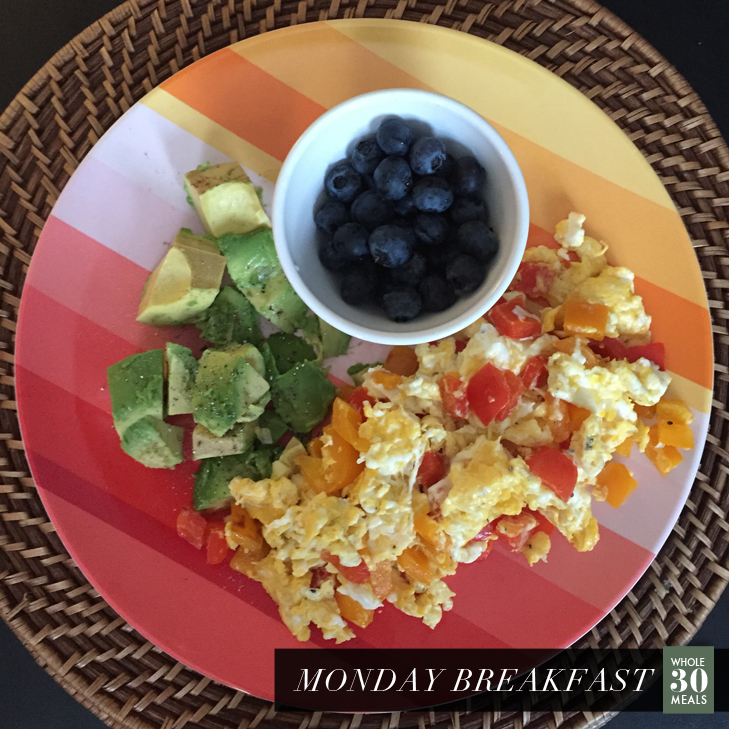 In this version I have chopped red and orange peppers cooked in coconut oil and three eggs. On the side - half an avocado and a small bowl of blueberries. 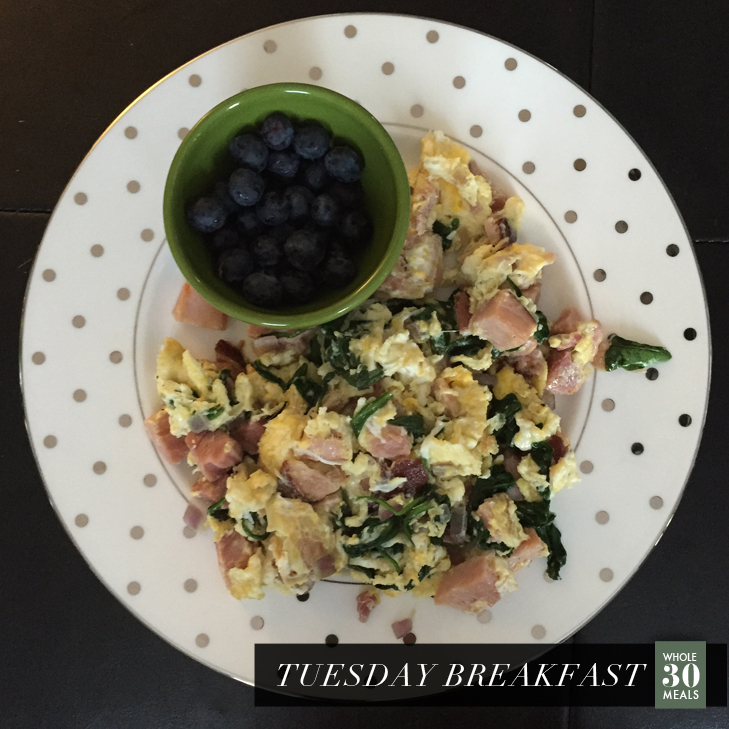 On Tuesday I woke up famished! I started with a banana (not pictured) while I cooked breakfast. Again, another scramble! I used Peak Brothers ham and spinached, cooked down in coconut oil. There might be some red onions in there too - I can’t remember! On the side, my trusty blueberries. A note about breakfast meats (or cured meats): they often have added sugar. 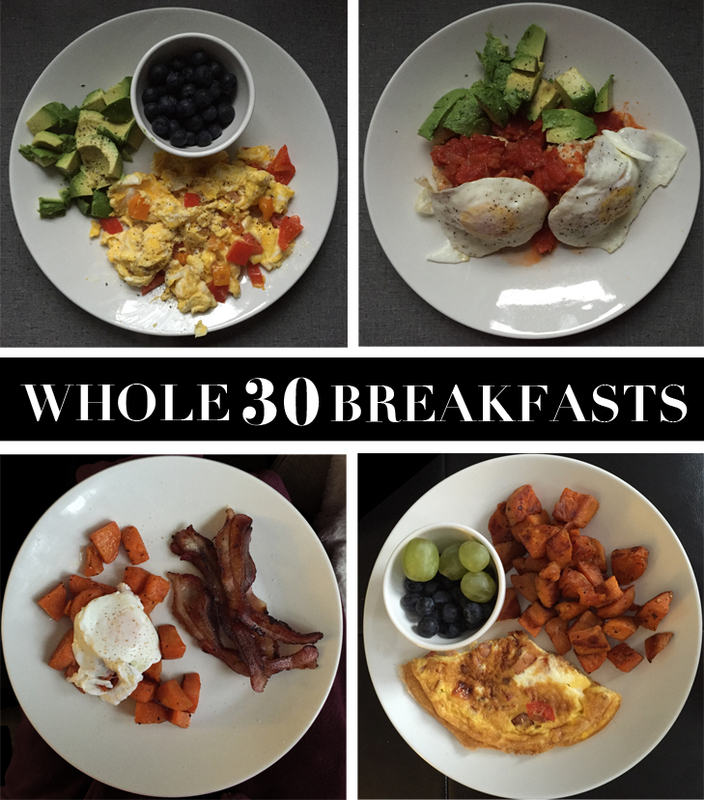 This a traditional Whole 30 no no, but Adam and I are ok with it for our thirty days. Do what works for you! Adam cooked our meal for Wednesday using left over roasted sweet potato cubes and making a frittata using ham, onion and red pepper. 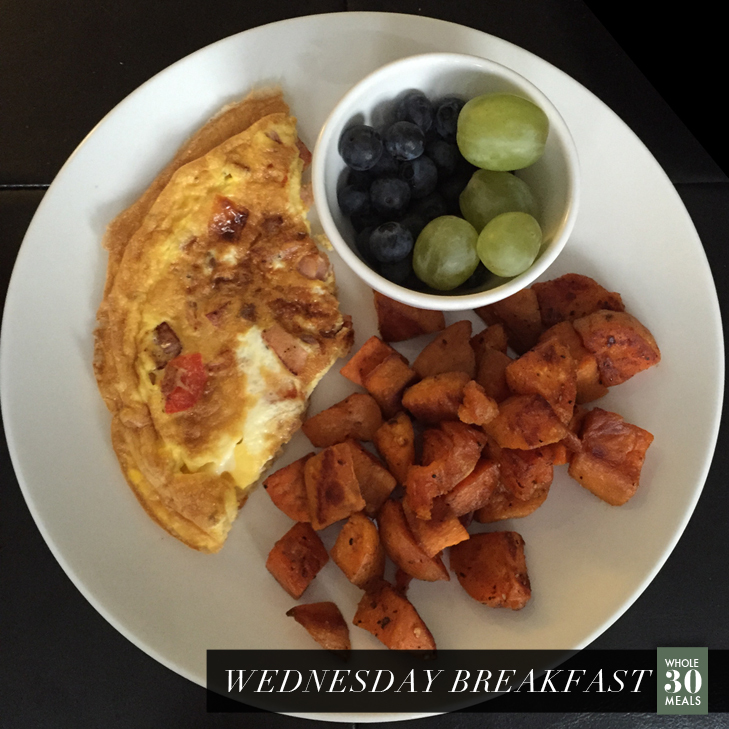 Green grapes and blueberries on the side! Thursday Breakfast was extra delicious! I warmed up left over turkey meatballs (using this recipe) with tomato sauce and two fried eggs on top and half an avocado on the side. Friday was a repeat of Monday. Some mornings just go with what’s easy. Some people like a lot of variety in their diets, but I’m the weird kind of person that can eat the exact same thing every day and not get sick of it for a month. 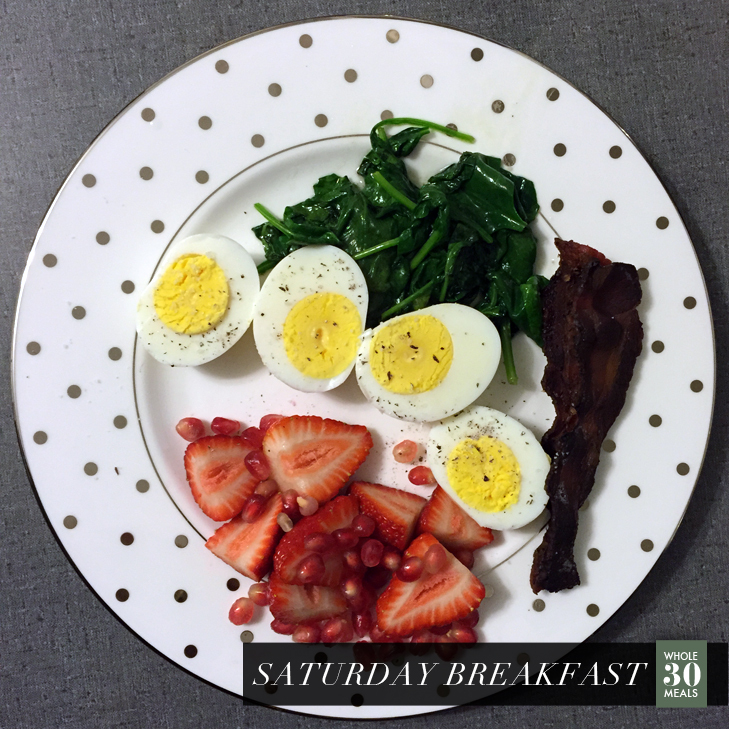 For a little change of pace, I switched things up to some hardboiled eggs (which I previously prepped by the dozen) along with some bacon (that got baked a little too long in the oven) and spinach sauteed in coconut oil and a mix of strawberries and pom seeds. Sunday my husband made breakfast! 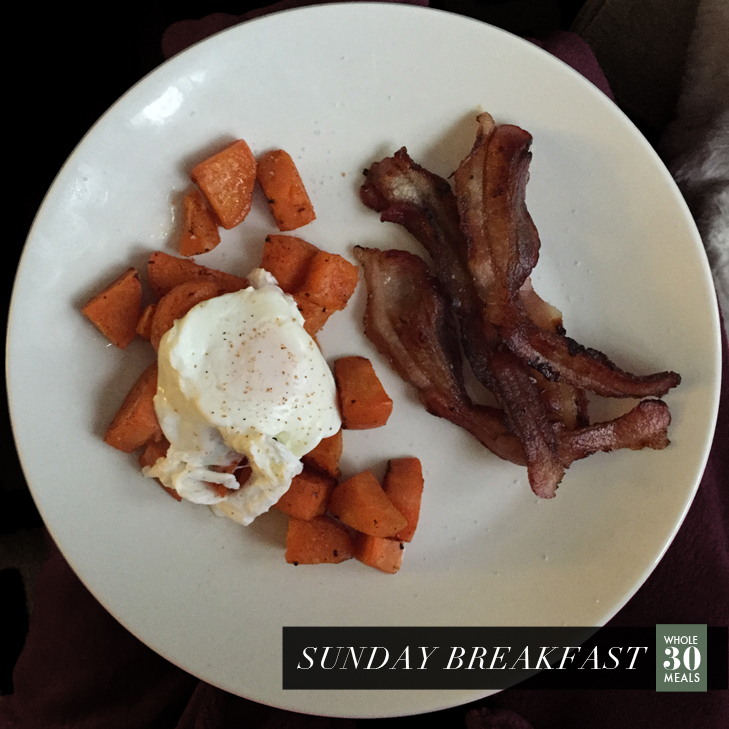 Roasted sweet potatoes with a poached egg on top and a side of bacon. Yum! As a side note, if you’re here just for fashion, please make sure you bookmark this link instead of What I Wore. If you really like food pics, be sure to follow me on Instagram!